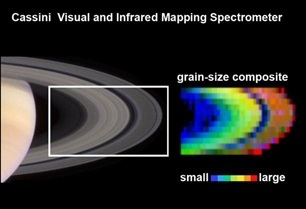 The archive of Cassini Visual and Infrared Mapping Spectrometer (VIMS) data is a single, multi-volume set that will span the entire mission. The archive volumes contain VIMS data products, instrument documentation, calibration files, calibration algorithms and documentation necessary to produce higher level calibrated products. The PDS Rings node has a dataset of Saturn ring radial profiles derived from VIMS stellar occultation data obtained during the prime mission. The data include ring radial profiles at 1 and 10 km resolution from more than 60 high quality VIMS occultations. You may browse the dataset COVIMS_8001, or download the entire dataset COVIMS_8001 tar.gz. Version 2 of this dataset, which expands the dataset coverage to the entire mission, is expected to be available in early 2019. VIMS occultation geometry tables (updated 4/3/18). This is a multi-tabbed Excel spreadsheet with information from the team’s database for all VIMS occultations. There are a total of 15 tabs which organize the information in several different ways. The spreadsheet may be downloaded and sliced and diced to make your own listing. The current plan is to convert the spreadsheet into CSV tables and to include them in version 2 of the VIMS occultation dataset. The tabs associated with this page describe the VIMS data files and how to obtain and use them. About VIMS Data - Discussion of the organization of the archive and links to key documents. Finding Data - Suggestions on how to search the archive for specific data. Accessing Data - Links to the data volumes. VIMS Calibration - Discussion of, and links to, available VIMS calibration files and software. VIMS QUBES are compatible with the Integrated Software for Imagers and Spectrometers (ISIS) software package which is available through the USGS Flagstaff web site. The USGS has developed a VIMS calibration pipeline. This pipeline is derived from the software provided by the team, upgraded to be compatible with ISIS3. Developing a local calibration pipeline based on the software provided on the VIMS volumes has proven challenging; consequently, users are strongly encouraged to explore the suitability of the USGS pipeline first. NOTE: VIMS pipeline scripts provided on the data volumes are compatible with ISIS2, not ISIS3. Another data analysis tool, CAVIAR, is in development and may be made available at some point in the future. It operates under IDL and can be run under IDL VM software which is available at no cost. It will be useful for both ISS and VIMS data analysis. We will supply links to the appropriate pages when they become available.